D.C. Area Educators for Social Justice, Center for Inspired Teaching, the Washington Teachers’ Union, and many more D.C. area educators and organizations are planning a Black Lives Matter Week of Action in Schools (February 5-10) as part of a national campaign. The goal of the Black Lives Matter Week of Action in Schools is to spark an ongoing movement of critical reflection and honest conversations in school communities for people of all ages to engage with critical issues of social justice. It is our duty as educators and community members to civically engage students and build their empathy, collaboration, and agency so they are able to thrive. The 13 guiding principles of the Black Lives Matter movement will be highlighted during this week of action as a means of challenging the insidious legacy of institutionalized racism and oppression that has plagued the U.S. since its founding. Each day will explore two to three of the Black Lives Matter movement thirteen guiding principles. In school, teachers across the district will implement Black Lives Matter Week of Action curriculum designed for pre-K through 12th grade classrooms. In the evening, there will be events for educators, students, stakeholders, and community members to actively engage in the movement. Learn more. This working group is geared towards English, Spanish, and Social Studies teachers in the DC area who are interested in collaborating on Central American curriculum. The majority of Latino students in DC schools have Central American heritage, however their history and literature is largely absent from the curriculum in D.C. schools and nationally. The purpose of this working group is to work collaboratively to build on our own knowledge about Central America; and to create and identify resources that incorporates the history, literature and culture of Central American peoples into the curriculum of DC area schools. Some of the activities we will engage in during our meetings include: field testing lessons; hearing from experts from local colleges and universities about Central America; screening documentaries and discussing how they can be used in the classroom; reading literature and poetry written by or about Central American history and culture and discuss how they can be used in the classroom; sharing resources. Stories from Our Classrooms is a two credit graduate course for classroom teachers, in all subject areas and from all grade levels, to give voice to their authentic classroom experiences. 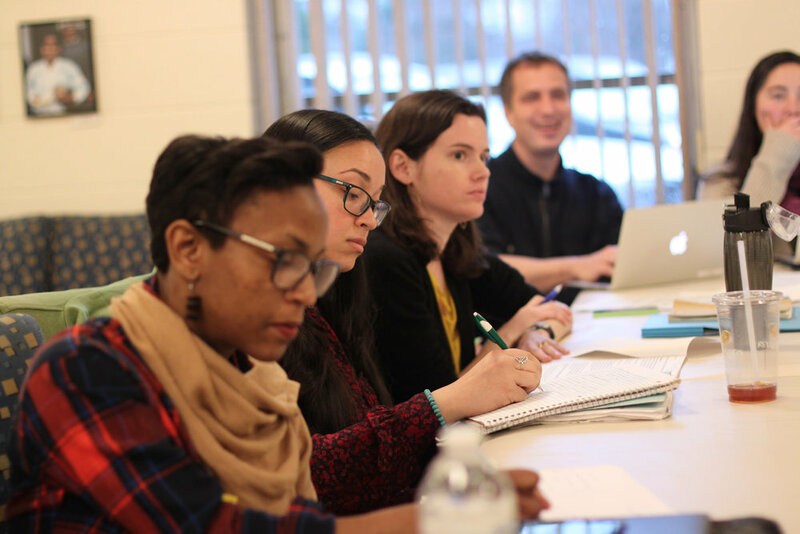 As a result of learning, writing, and reflecting together, the teacher participants deepen their own practice, build community among D.C. area social justice educators, and contribute to the all too scarce collection of published descriptions of classroom practice by classroom teachers themselves. The participants are coached through a variety of writing exercises and provide one another ongoing feedback through peer response groups. Each participant writes and revises a story with the specific goal of publication. In addition, guest authors and editors attend some sessions to share insights and experiences related to publication. Learn more and apply for the 2018-2019 school year.